I’m doing a little menu planning right now for my annual Christmas trip to my parents’ house, where we’ll (mostly I’ll) be cooking 3 meals a day for at least a dozen or more people. And this does require planning otherwise we will be schlepping to the market multiple times a day. And why would I want to do that when I can be obsessing over a 1000 piece puzzle all day, ignoring everyone around me? Exactly. I don’t often think of salads when I meal plan during the winter in New York, but since it’s about 65 degrees there right now, I’m rethinking that and this will be on the menu for one dinner. This is my new favorite winter salad. I specify winter salad because I don’t make the same salads in the winter as I do in the summer. There are no local tomatoes or cucumbers right now, but there is fresh fennel and juicy citrus. I’ve been teaching this salad in my classes this month and everyone is loving it. It’s light and refreshing and easy as pie to make. I think this would be perfect with fish, poultry or pork. 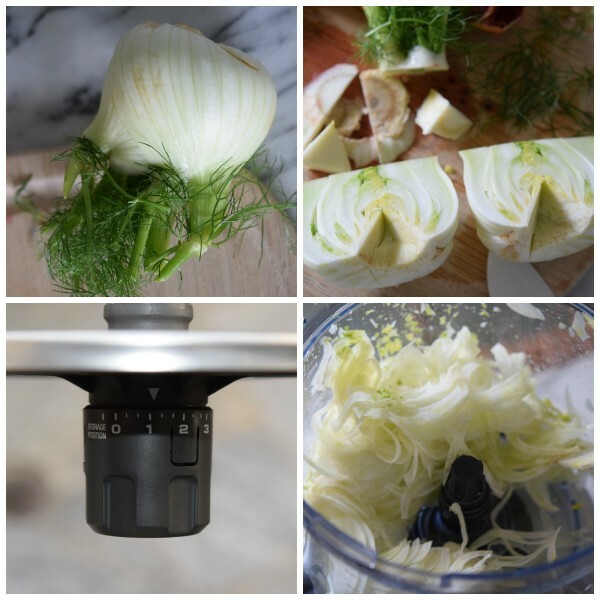 Fennel is also an amazing digestive aid, which comes in very handy during the holidays. Wink, wink. As a child, I remember after a big pasta and meat dinner, my aunt would pass around a platter of raw fennel wedges and a bowl of clementines for dessert. It was the perfect end to a rich meal, but I loved fennel because it subtly tastes like licorice. So yummy. It wasn’t until I was an adult that I learned not all people ate raw fennel from a blue and white Wedgewood platter after dinner! 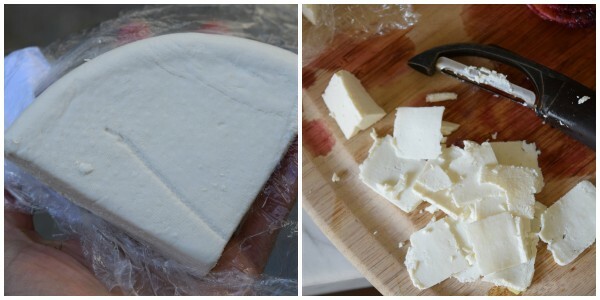 The image below is ricotta salata, which I love. It’s a dried ricotta made from sheep’s milk cheese, with a firm, but creamy texture and a little salty. Unfortunately, it’s not easy to find. I buy it at my local Whole Foods, but there’s no other store in town that sells it. So when WF is out of it, I’ll use shaved Parmigiano-Reggiano, which is also delicious here. But a good feta is also a nice sub. If you’ve taken my classes in the last year, you know how obsessed I am with my new food processor. This is NOT a sponsored post for Breville even though I would be totally thrilled if they noticed me ;). I just think the adjustable slicing disc is genius. So I was able to go pretty thin with the fennel, but you can also do this with a mandoline or with a very sharp knife. If you have the Breville Sous Chef, I set the slicing blade anywhere between 1/2 and 1. Otherwise, just use the standard Cuisinart slicing disc. If you have no idea what I’m talking about, watch my YouTube video on how to use your food processor. And while you’re at it, check out this post for how to segment citrus. I think the presentation of this salad is a little tricky, though. 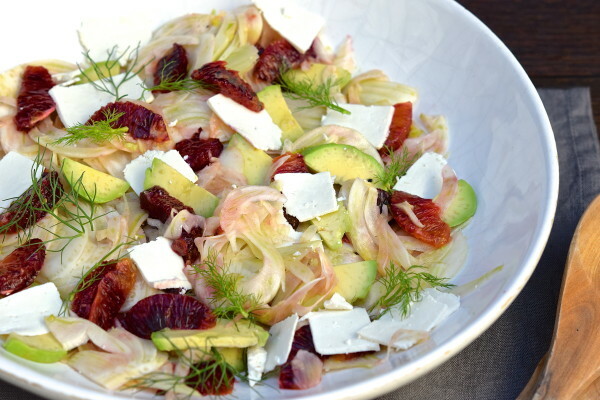 The best method is if you have a large platter on which you can spread the fennel ribbons in one layer and then tuck the grapefruit and avocado slices in randomly. Don’t worry about it being perfect. I apologized to a few of my groups this month that I couldn’t take the time to make this salad look more beautiful and I realized that was silly. It looked good enough to eat and it was gobbled up in record time. And that is good enough for me! ⅓ pound ricotta salata, shaved (if unavailable, feta or Parmesan are nice alternatives) Do not slice with a food processor. Use a knife or vegetable peeler. In a glass jar with a tight-fitting lid, combine dressing ingredients, shake until emulsified and set aside. Halve the fennel bulb and remove the core. As thinly as possible, slice the fennel lengthwise. Use a mandolin, extra-thin blade on your food processor, vegetable peeler or a knife. 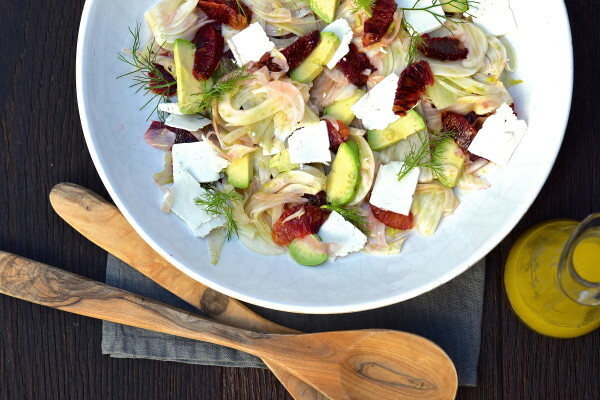 Place fennel in a large bowl. Arrange the fennel across a big platter and toss with enough dressing to moisten lightly. 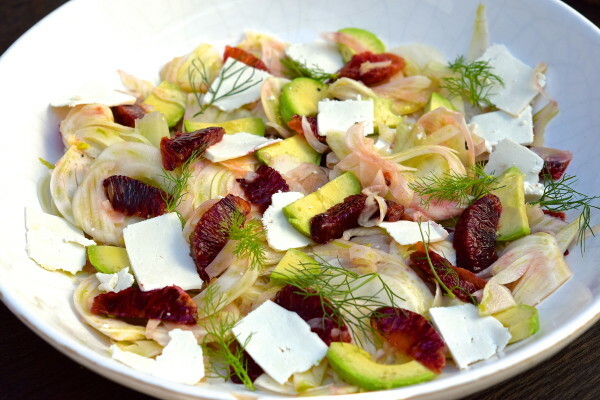 Tuck the citrus segments and avocado slices into the fennel and scatter the cheese. Drizzle remaining dressing or only as much as is needed. Garnish with fennel fronds, if desired. Sprinkle with flaky sea salt. Love that Kite Hill cheese! Ricotta salata is firm, though. Not like wet ricotta. If Kite Hill has a firm, shaveable cheese, go with that. I am loving this food processor!